Have you ever played the age-old game? Did your mother or grandmother ever bring out a button tin to help you pass the time on a rainy day? on a doll quilt together and she and her brother had a wonderful time sorting buttons and then selecting just the right ones to finish the quilt for the doll bed at my house. Buttons are as old as clothing and over the centuries have been made from bone, antlers, pottery, and wood. Of course kings didn't want anything so common ... enter buttons made of gold or glass and buttons set with precious stones. Special buttons were created to celebrate George Washington's inauguration. A commemorative button was produced as a souvenir for those attending the 1876 exposition in Philadelphia. Both these buttons are prized by button collectors today. 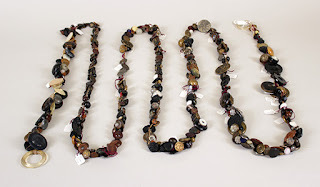 In America, German immigrant John Boepple created an industry in Muscatine, Iowa, making buttons from the fresh water mussels in the Mississippi River. Muscatine, Iowa, eventually became the largest manufacturer of fresh water pearl buttons in the world. In 1898, Iowa produced over 138 million buttons! Buttons were the subject of a collecting craze in the Victorian era. Ladies gathered buttons on a string variously called a charm string, a love string, or a memory string. 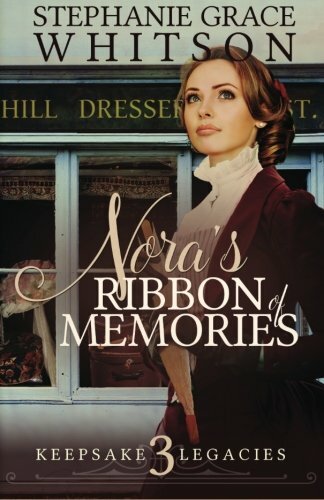 Depending on where you lived, folklore indicated that the gentleman who gave a young lady the one-thousandth button was fated to become her husband. Another version of the story was that the young lady who got that thousandth button was fated to be an old maid. The practice of gathering buttons on a string was even memorialized in a sad, sad song (cover of the sheet music at right) published in 1870. I'll not want it anymore. I'll be on the golden shore. All her pretty button string. My favorite button story involves a French button engraved with the letters L, A, C, D. Pronouncing those letters in French creates a play on words, for the letters can also be words that would send a special message to someone courting a lady. Elle a cede ... "she has given in." Can't you just imagine the joy receiving a button like that would give a young man who'd met with initial resistance to his attentions? Button, button ... do you collect buttons? 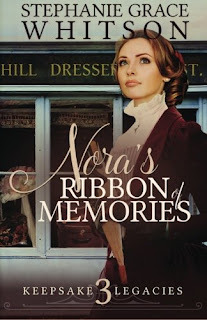 Stephanie Grace Whitson's recently re-released novel, Nora's Ribbon of Memories, tells the story of an entrepreneur who becomes a dressmaker-milliner ... and creates her own string of memories by collecting special buttons. I love your post! I am a button collector and I several wonderful button jars filled with all kinds of buttons. Thanks, Melanie. I remember seeing cards with buttons attached in designs at some antique shows in the past ... I always want to know the stories. Very interesting post. I don't collect buttons, but it sounds like a great collection to have. Thanks for sharing. Glad you enjoyed the post. One fun thing about collecting buttons would be ... no dusting required LOL. I remember my Grandmother's button collection and spending rainy days sorting through it. I wonder where it ended up, I'll have to check with my mother. This post brought back childhood memories. I have so many containers of buttons and they are so fun to use on quilting items and other craft projects.